Astronomy Technology Executive Editor Gary Parkerson is traveling over 10,000 miles and will visit all lower 48 states to generate awareness of amateur astronomy and the viability of cycling for transportation. 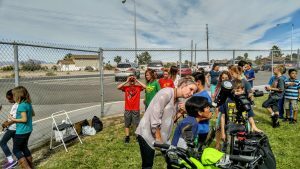 The Pedaling Astronomer project is an educational effort to generate awareness and to promote: (1) the hobby of amateur astronomy and (2) the viability of cycling as a practical form of transportation. The project is centered around the upcoming Great American 2017Solar Eclipse, which will travel across the United States on Monday, August 21, 2017. The Pedaling Astronomer project is a 10,000-mile solo bicycling journey by Gary Parkerson, “The Pedaling Astronomer,” through all of the lower 48 US states and Washington, DC. The project is the brainchild of Parkerson who, by night is an internationally recognized authority for amateur astronomy equipment and editor of Astronomy Technology Today. By day, he is a dedicated cycling enthusiast. During the trip, Gary is sharing spectacular telescope views of the Sun and bright night-sky objects, as well as providing educational talks on cycling as a real and viable alternative transportation option. 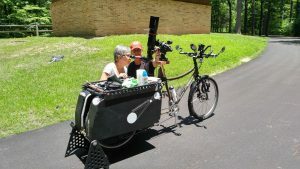 Parkerson has been riding a custom outfitted “Surly Big” bicycle complete with traveling supplies, the latest in mobile communications, and a full set astronomy gear for daytime and nighttime observing. 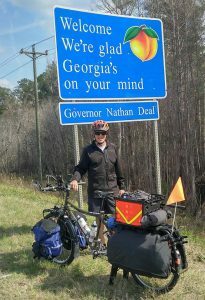 Parkerson has been riding individual legs of the trip throughout 2016 and 2017 (already visiting 40 states) and will conclude with a ride to Nashville, Tennessee, which is the largest U.S. city in the eclipse’s path and the largest to experience eclipse totality (the Sun will be totally covered by the Moon) during the eclipse. He will participate in Nashville’s Music City Solar Eclipse giving talks, solar viewing demonstrations and live streaming the event itself. 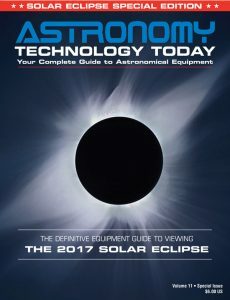 To help people learn more about how to safely view and image the 2017 Solar Eclipse, Parkerson has published a Solar eclipse equipment guide – The Definitive Equipment Guide to the 2017 Solar Eclipse. His goal with the 40-page publication is to provide an easy-to-consume introduction to the technological options for viewing and imaging the Great American Solar Eclipse. He covers the gamut of options available including building a solar viewer, solar glasses, smart phones, DSLR cameras, using astronomy telescopes, solar telescopes, using binoculars, solar filters (including a DYI filter option), CCD astro cameras, astro video cameras, webcams and much more. The guide is available on the Astronomy Technology Today website here – it’s free, and there is no requirement to sign up to read the guide.